Our Hawaiian pie flavors are constantly changing. With 50 sweet pie flavors and 31 savory flavors, we have a Hawaiian Pie flavor for every taste! Make sure to check out our Facebook Page for our daily flavors. 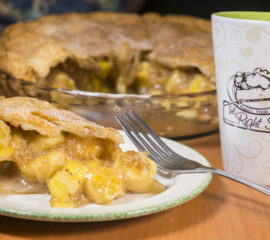 Our large pies are deep dish and baked in your choice of recyclable aluminum pans or glass pie plates. Receive a $10 store credit when you return the glass pan! 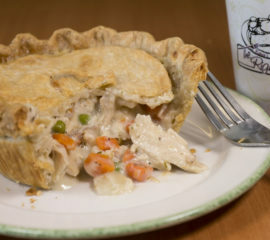 We also offer an 8-inch Baby Pie… these serve 4-6 people and can be ordered online for pickup as well. 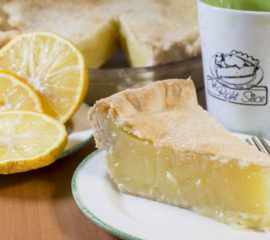 You can enjoy just a slice of our fresh baked pies at our Kalaheo full service bakery, in Lihue at our Pie on the Fly automated location or at any of our community events around the island. Can’t agree on one flavor?!? Everyone can enjoy their own slice! Don’t forget those extra special requests. We can do your wedding, birthday or graduation pies with a special order. Looking for a special flavor, it never hurts to ask. We are always experimenting with new ideas. We also offer both Gluten Free and No Sugar Added alternatives. Be sure to note our seasonal flavors as well! – or to be shipped! 2019 is going to be a spectacular year for us here at The Right Slice! First, it is the beginning of our 10th anniversary year! Can you believe we will be celebrating 10 years in business later this year?!? Amazing! I can’t believe how the time has flown. We are also excited that after 4 very stressful years of legal issues, we have FINALLY locked in a long term lease at our Kalaheo location! We are here to stay, Kalaheo!